The Anchor lab (right) is located directly adjacent to the brewhouse. 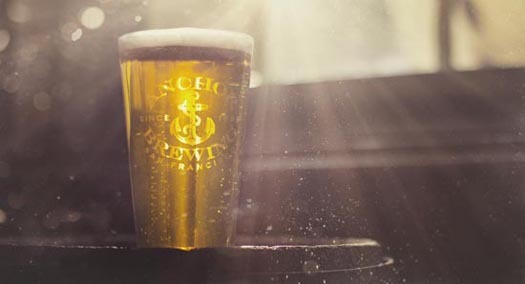 No matter which beer, which day of the week, the weather outside the brewery, the season… the quest to maintain a high level of quality and a consistent flavor profile in every Anchor brew is perpetual. If you work in the lab at Anchor Brewing, your day typically involves a combination of testing, analysis, and overarching production needs that the lab supports. Essentially, our lab techs’ daily task is to make sure that each and every beer – all 156,000+ beer barrels worth in 2014 – of a given beer style that leaves this building headed for any of one our distributors across the U.S. and around the world is the same. Same color, aroma, flavor, carbonation, mouthfeel, face label and neck label alignment, etc. The list goes on. 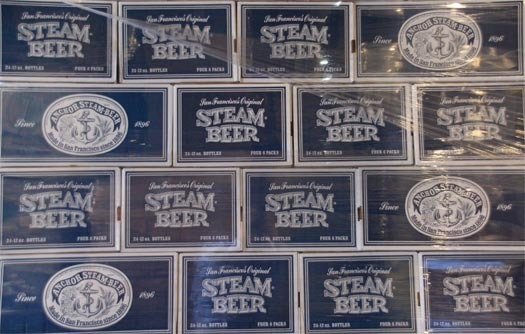 Cases of Anchor Steam Beer ready to be shipped. The lab here at Anchor, or at any craft brewery for that matter, is one aspect of the brewing process that is sometimes overlooked. But when you take a closer look, the role of the lab is actually one of the most important components of the finished product. Think about it: What if no quality checks were done? What if consistency was not a top priority? And, what if each of the 3,000+ craft breweries operating today decided to take the same renegade approach to brewing their beer? As you can probably imagine, the quality of the beers we enjoy today would suffer, and as a result, so would the industry as a whole. Paul Gatza, Director of the Brewers Association, the Boulder-based trade association for small and independent American craft brewers, said in 2014 at the annual Craft Brewers Conference (and again in his 2015 opening remarks) that consistency and quality is of utmost importance as today’s craft breweries work together to grow the category. First impressions on new consumers can only happen, as they say, once. If a perception were to appear among new (and old) craft beer drinkers that overall quality was lower than expected, years of hard work would be lost in a fraction of the time it took to build. The lab at Anchor, like other departments, wears many hats. They test for beer spoilage and bacteria in all packaged beer. They test for correct dissolved O2 levels. They work alongside the fermentation team on things like ensuring the ABV, PH, color, bottle head space, IBUs, and other key analytical parameters are 100% correct for each beer being brewed. Samples of each brew are collected in the brewhouse for analysis in the lab. 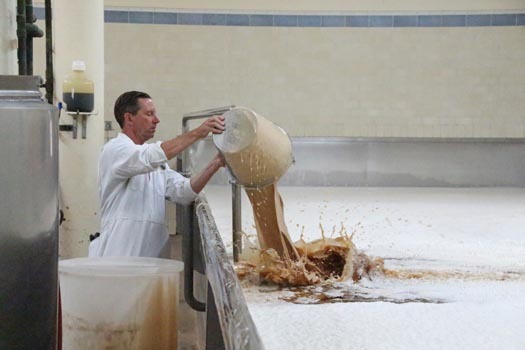 “Pitching” yeast into a brew of Anchor Steam Beer. Every day at 1pm a critical activity takes place: tasting. The lab team assembles to taste beer from the conditioning tanks before it’s sent into filtration. They then taste the beer that’s been filtered, racked, and packaged that day. 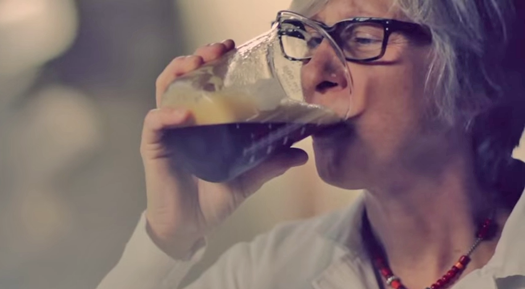 Andrea and the team from the Anchor lab taste each brew of Anchor beer before it’s packaged. 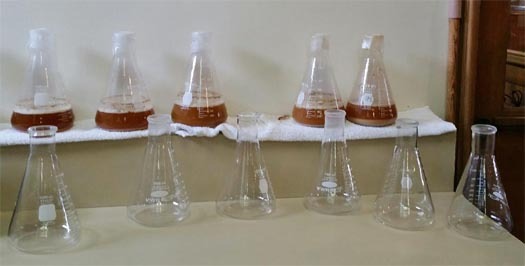 Breweries that don’t have an in-house lab often use simple testing equipment, and may also send samples out to off-site beer labs for deeper analysis that cannot be done in their own facilities. As a brewer AND a winemaker, Fritz would certainly know. Next time you pull up a bar stool or crack open a brew at home with friends and family, remember the journey that beer has taken to get to your glass, and the personal care that went into making sure it tastes just right.